RALLY in HERALD SQUARE PARK (34th St. & Broadway, Manhattan) WEDNESDAY, APRIL 29, 2015, 5 PM before the RGB Preliminary Vote starts at 6 PM at the CUNY Grad Center @ 365 5th Ave. There are nearly million rent regulated apartments in New York City, which offer important affordability protections for tenants. 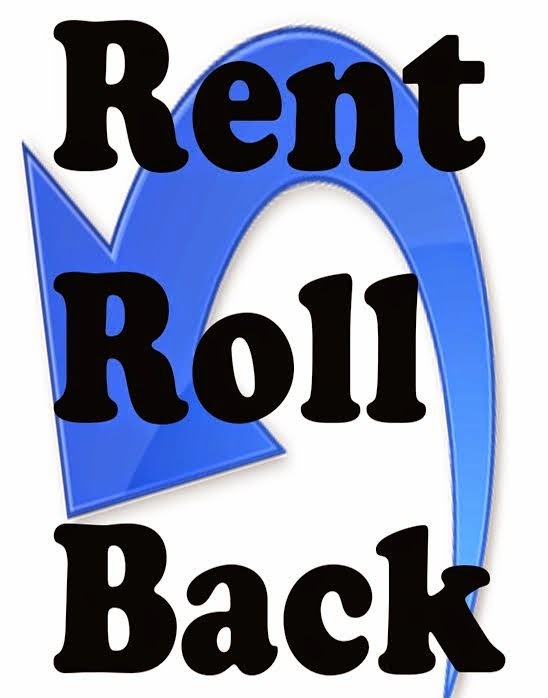 The current law governing rent regulation will expire in June 2015 and will be up for renewal by the New YorkState legislature in its new session, beginning this January. The question before legislators will be whether to strengthen the existing law by preserving existing units and protecting affordability; or whether to allow the ongoing process of vacancy deregulation by which previously regulated apartments become subject to market rates. 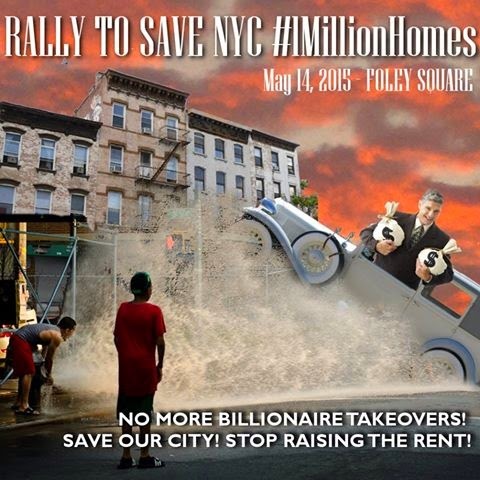 Save the Date: Rally to Save One Million Homes on May 14 (new date!) 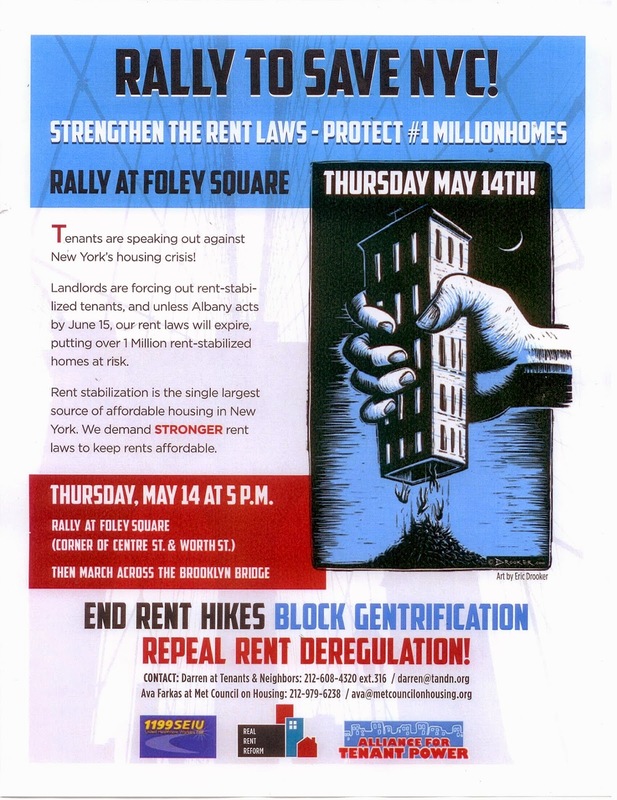 : The Real Rent Reform Campaign and the Alliance for Tenant Power are hosting a rally on May 14th at 5PM to fight for renewing and strengthening New York’s rent regulation laws. Location to be determined. For more information contact Darren at 212-608-4320 or Darren@tandn.org. Monday, April 13, 2015 -- 6:30 pm - 8:30 pm -- at the 1199 SEIU MLK Labor Center auditorium, 310 W. 43rd St. between 8th and 9th Avenues. Has your Assembly Member co-sponsored the bill to repeal vacancy deregulation & re-regulate many apartments? Assembly bill1865-A (Linda Rosenthal, et al.) repeals Vacancy Deregulation and re-regulates 98 percent of the apartments that have been deregulated through Vacancy Deregulation in the last two decades. To see which Assembly members have put their names on this bill as co-prime sponsors or multi-sponsors, go to www.assembly.state.ny.us/leg and type in A1865-A. Please do what you can to recruit additional sponsors. See the list below, broken down by county/borough.